Oil prices are finally normalizing somewhat, at least at the national level. NYMEX crude prices are currently at $48.00, after closing Friday at a lofty $47.29. Crude prices fell from a pre-Harvey high of $48 down to the $45 range, but today are more in line with their pre-Harvey prices. This is the trend across the board, with crude down just slightly from pre-Harvey levels and refined products slightly higher. Gasoline prices are down significantly. Before Harvey, NYMEX gasoline prices were trading on either side of $1.60. The storm brought prices to nearly $2.15 at its worst, with nearly 30% of all U.S. refineries offline. Gas prices have shed nearly all the gains they made during the storm, returning to $1.6822. Diesel prices have been more stubborn; they rose slowly and steadily, but have not yet given up their gains. Diesel rose from pre-Harvey levels of $1.58 to $1.76 at their peak, less than a twenty-cent range. Prices this morning remain near the peak, trading at $1.7321. 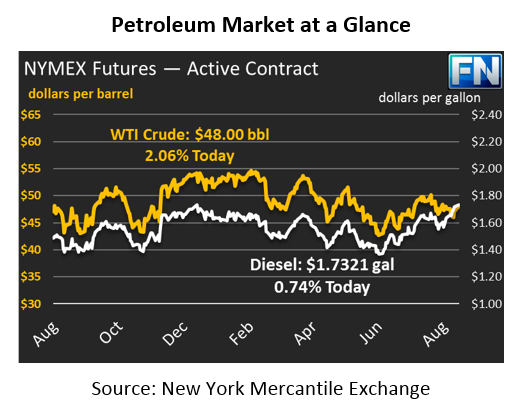 While the NYMEX has returned to normal levels, don’t expect to see fuel prices come down overnight. Basis prices, the difference between the NYMEX future contract and physical fuel deliverable today in an area, remain extremely elevated for gasoline. 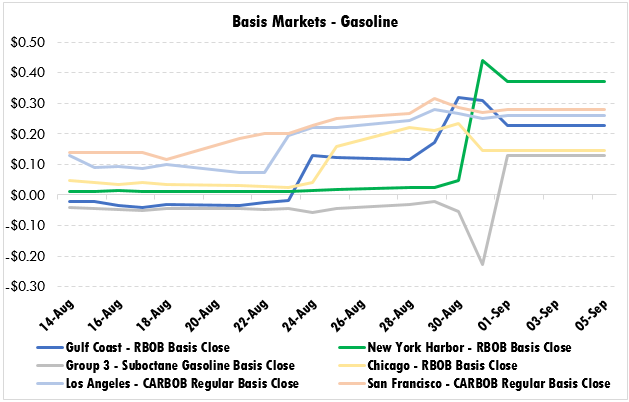 Gulf Coast basis (blue) has risen from below 0 to over twenty cents; NY Harbor gasoline basis (green) has risen from almost 0 to roughly 40 cents! When calculating fuel prices, remember that wholesale prices are more closely correlated with local markets than with the NYMEX. Although the NYMEX has returned to normal levels, basis levels remain elevated, meaning that gasoline prices will still be high tomorrow, though not as high. Diesel basis levels are also elevated, though those price effects are in the range of 5-10 cents, rather than 20-40 cents. Goldman Sachs estimates refinery outages are now just 2.8 million barrels per day (MMbpd), compared to 5 MMbpd at the peak of the damage. The Colonial Pipeline’s gasoline line remains offline west of Louisiana, though resumed operations are expected today. The Southeast continues to feel the effects of the gasoline shortage, though diesel is once again flowing from Houston to the Southeast. As noted above, basis prices in the Southeast (Gulf Coast basis) are still very elevated following the storm, but have fallen slightly. Mansfield remains on Code Red for Texas and the Southeast. Shifting to a global view, Russia and Saudi Arabia met to discuss extending the global OPEC/Non-OPEC cuts an additional three months through June 2018. Geopolitical threats are escalating, with North Korea announcing its sixth nuclear test on Sunday. China has struggled to contain the North Korean threat, and some global leaders have claimed that North Korea is on the path to war. Markets currently are not pricing in a large risk premium for the instability, but that situation could change with time.